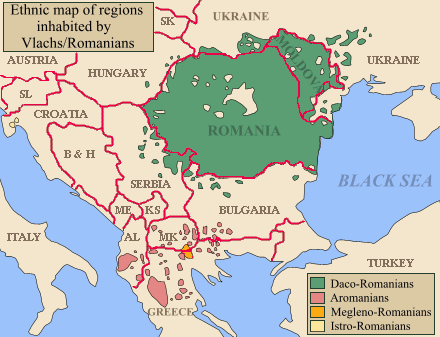 I was previously dimly aware of the existence of Aromanian (shown in red above), but what most fascinated me were the Istro-Romanians. They’re two tiny dots of yellow over there in Croatia. They are the smallest ethnic group in Europe, numbering less than 1000 speakers, spread among a handful of villages and hamlets. Of course, that doesn’t mean that they don’t have a website. The website is, in fact, very good, with a reasonable pronunciation guide and a variety of resources. I’m sure that my readership contains plenty of people who actually speak Istro-Romanian and would be happy to correct me. Cred ca ultimul vers vrea sa zica ca au pierdut pana si camasa de pe ei.